Lights, Camera... party time ! 2 Hour party with no sharing and unlimited kids. You provide all your own birthday goods and do your own party. 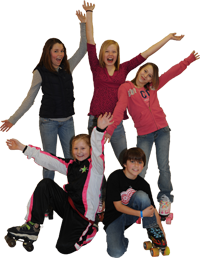 This booking includes: Admission, regular skate rental, music, ice, games, and prizes. Birthday child gets a FREE T-shirt and FREE RETURN PASS! This is a 2 hour party for a max of 30 kids and location is shared with only one other party. The first party booked will receive the party room, while the other party will have additional tables reserved and set up. (note: with semi-private parties will not be booked with more than 3 years age difference between parties.) You provide all the Birthday goods and do your own party. 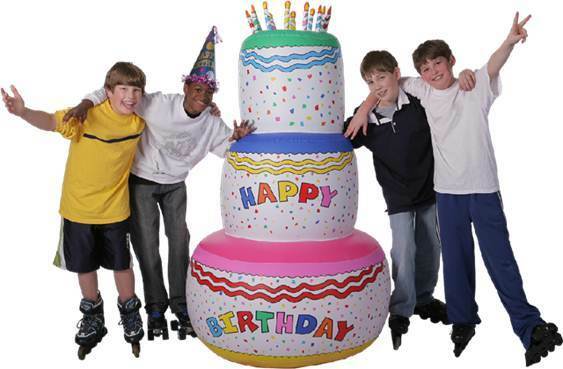 This party includes admission, regular skate rental, ice, music and games along with prizes. Birthday child gets a FREE T-Shirt and FREE SKATE PASS! This is a two hour party for kids 10 and under during our Saturday morning 'Little People Skate' from 10 am till 12 pm. Also available on Sunday afternoon from 2 pm till 4 pm during our family skate time. (Sunday session is seasonal, October - May only) You supply cake, candles and kids and we will supply the rest. Party includes: Invitations, balloons, matching place settings (plate, napkins and forks), ice cream, and small drink at time of serving. Price includes 12 kids for the party, each additional child is $5. No outside food or drink allowed. $4 per skater with a minimum of 35 skaters. You are always welcome to bring your own food and drinks. Please bring your own music. We will play your music and lead the games. We provide great times for school outings. Please call for more information on booking times available for your school event.